I'm not sure this is really a castle, but it does have towers and crenelations. The state hospital was the first institution built to treat alcoholism as a mental disorder. It was built in 1858 and is one of the most endangered historical places in the nation. It's style is gothic revival so it is not really a castle but we call it the castle on the hill. It was built by Issac G. Perry. The asylum admitted its first patient in 1864 and in 1993 the building was closed following collapse of a section of parapet on the west facade. 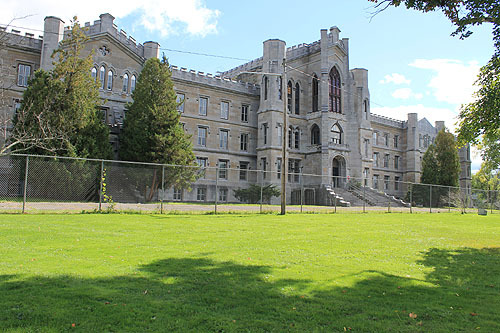 The asylum was listed in 1997 as a national Historic landmark and is now in the process of repurposing as an education facility. Thanks to Nick Bambino for taking and sending the photo.